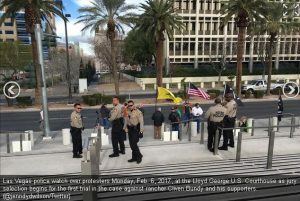 Bundy Protesters Clash Las Vegas Federal Trial | RANGEfire! 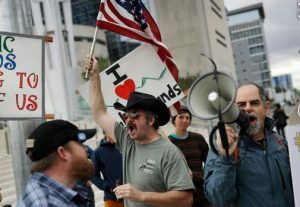 Kieran Suckling, executive director of the Center for Biological Diversity, and environmental activist organization, leads Anti-Bundy protests in Las Vegas as the first Bunkerville trial begins. Constitutional issues took center stage Monday when the first trial in the case against rancher Cliven Bundy and his supporters opened with jury selection in Las Vegas. The selection process at times resembled more of a political discussion than a courtroom proceeding, as lawyers grilled potential jurors about constitutional rights, marches and protests, federal authority, police conduct and news media. The extensive questioning provides defense attorneys and prosecutors the opportunity to identify people they do or do not want on the jury. Later this week, each side will be allowed to dismiss a limited number of jurors without showing cause. Federal prosecutors have portrayed the six gunmen standing trial as militant, anti-government extremists who put authorities and the public in danger during an armed confrontation against law enforcement officers in 2014. The defendants contend they were patriots who exercised their constitutional rights to freely assemble and to bear arms during protests in Bunkerville over the seizure of Bundy’s cattle from federal lands. As a result, defense attorneys focused on ideological themes in questioning potential jurors. “If somebody went to a protest for Second Amendment rights … if nobody got hurt, would anyone have a problem?” Engel asked potential jurors. No shots were fired during the armed standoff near Bundy’s ranch three years ago. Engel prefaced some questions with his own commentary, and U.S. District Judge Gloria Navarro reminded him several times he was not allowed to make arguments. One defense attorney asked potential jurors if they felt scared or uneasy around guns. None said they did. “If the women that marched right after the inauguration were carrying weapons, would that be considered a violent protest?” defense attorney Terrence Jackson asked the group, referring to the Women’s March on Washington that followed President Donald Trump’s inauguration. The six people charged as gunmen traveled to Bunkerville upon learning of the protests online and later became entangled in the standoff against Bureau of Land Management authorities. The government’s evidence includes Facebook posts and blogs published by those involved in the case, and potential jurors were asked about their news consumption and social media habits, as well as whether they think the media are reliable.